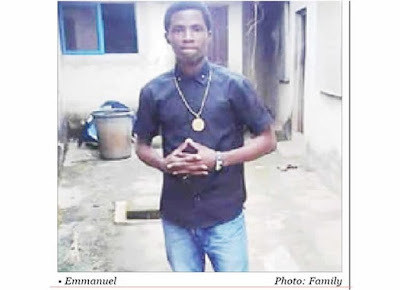 When Emmanuel Omuta bade his mother goodbye while leaving for a vigil last Friday, little did they know they were exchanging their last pleasantries. who made away with his laptop in the Agbado Crossing area of Ogun State while he was returning from the vigil in the early hours of Saturday, November 24, 2018. The Punch gathered that Emmanuel was killed a walking distance away from a police station. It was alleged that despite the victim’s cry for help, the police failed to rescue him. Speaking to The Punch on the telephone, the distraught mother of the deceased, Christiana Omuta, said despite the fact that the incident was reported to the police, they had not done anything about it. The mother of five stated, “My son worked as a projector operator and he was always invited to churches. On Friday, he told me that he was going for a vigil. On his way back from the vigil around 6am on Saturday, he was attacked by some criminals. He was trying to protect his laptop, so he was stabbed. “In the morning, when his brother was going out, he saw his brother’s corpse beside the road. He immediately ran home to inform me. By the time I got there, I realised that he was the one. The widowed mother said she had yet to recover from the grief of losing her husband, adding that the death of her son had left her empty. A friend of the family, who spoke on condition of anonymity, said the police failed in their duty to protect one of the lives entrusted to their care, adding that the deceased had a promising future. The family friend stated, “When the incident happened, I was called upon by the family, because the deceased was very close to me and he was an obedient boy. The duty of the police is to protect lives and properties, but they failed a 20-year-old boy, who just gained admission to a higher institution and had a promising future. “I went to the Ayinla Police Station with my friends to ask them how possible it was for someone to be attacked very close to the station and they couldn’t hear any noise. Besides the fact that there is a police station that is a short distance away, there is also a police post closer to where the incident happened. “During our interaction with the police, we found out that the police officers heard the cry of the boy for help but they refused to help him. One of the policemen had the boldness to tell us that the boy should have left his laptop for the hoodlums since he was alone. When the Ogun State Police Public Relations Officer, Abimbola Oyeyemi, was contacted, he said the allegation was baseless, adding that investigation must be made before any arrest could be effected. Oyeyemi said, “The people who are accusing the police, were they there when the boy was being attacked and the police did not come there? The police were not there when the incident happened. If they say the attackers are known criminals, they should reveal their identities to the police.